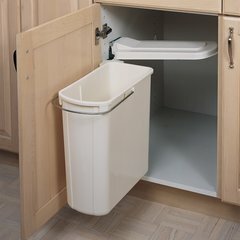 These pivot out waste containers are ideal for keeping garbage out of sight but conveniently accessible under the vanity sink. Minimum Cabinet Opening Width : 16.25"
I was very happy to be able to order a replacement of this product from Cabinet Parts. We owned another cabinet trash can made by the same manufacturer which served our home well for 15 years. The old one was more attractive, but we were happy to find similar product again. In general it is a good product. Installation instructions are a real headache. Without knowing how this can operates we would not have been able to install it based on the enclosed instructions. This is why I am giving it a lower rating. This clever little trash pullout fit under a large undermount sink and installs easily if you familiarize yourself with the directions first. Great item and fit well if the cabinet is straight with the door (same level). Otherwise, it won't fit! You have to level the interior of the cabinet with the opening of the door. Some work to do. The final result is good if you take time to make the adjustment prior of installing it.